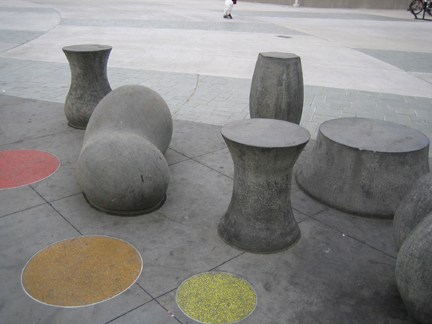 Beep Inc (Pae White, artist and Tom Marble, architect) Suisman Urban Design, urban designer/architect. 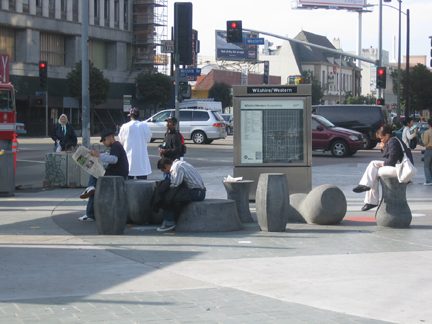 Metro Rapid bus stop, Wilshire and Western. Beep Inc's proposal included affecting the interior of the Metro Rapid buses through a redesign of the seat fabric and using overhead advertising strips to tell a story while adding concrete seats at selected stops. All these elements are woven together through narrative vignettes tying symbols taken from historic Los Angeles Railroad tickets from the 30's and 40's to the myriad of communities encountered along Metro Rapid routes.